Well, I think I've finally gone over the edge. Yes, I've found another typewriter that I just HAD TO HAVE. 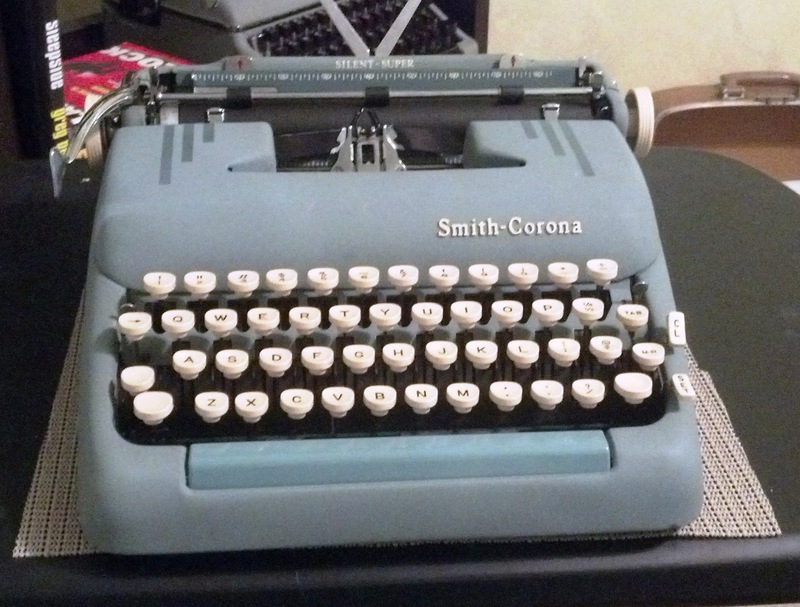 I must say though, that I think I just bought the best that Smith-Corona ever made. The only thing I can do now to improve my typewriter collection is to buy more of the same model in different colors ... although, I've kind of been eyeballing one of the old Corona 3 foldable typewriters lately. I also must leak some future news in the writing area. I think you'll like it, but you'll just have to wait until next month. I actually thought about writing some of my mystery/crime/suspense works in progress on this new typewriter but then thought about the lack of auto correct, and cut and past, and quickly squelched that idea before it could fester. Yeah, it looks more blue than green but not as blue as it appears in the pictures. Won this on auction at ebay for a whopping thirty-nine dollars! I don't know, did Smith-Corona sell this in blue in 1958? Fine typewriter. I do think baby blue was the original color. Gorgeous machine. Well worth blowing the collective space restraints to acquire. I'd love one myself! I have a '56 model and it's my go-to typewriter when I want smooth typing. These are rock-solid machines. Very snappy, they can put some newer typewriters to shame. Thanks for the comments. L.G.-you'd be surprised how easy it is to let the words flow (free-writing, mind-mapping) using one of these nostalgic machines. Although I must say, you are so right. 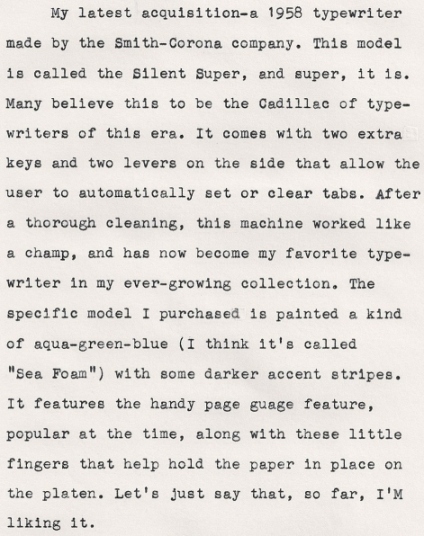 I am amazed at the authors of old that typed (and re-typed) entire manuscripts without the used of features like 'find and replace' 'cut and paste' or even auto tab and centering. That Smith-Corona is a reliable and pleasant typewriter for regular use. Nice powder blue color too. Congratulations. A wonderful machine. I have four models from 1950 to 1958. Your baby-blue machine is beautiful, enjoy.